​​​​We all know that eating fruits and vegetables is important. But how do you get kids to eat more of these foods? Provide fruits and vegetables as snacks. Keep fruit washed, cut up and in plain sight in the refrigerator. Serve salads more often. Get prewashed, bagged salad at the grocery store. Teach your child what an appropriate amount of salad dressing is and how it can be ordered on the side at restaurants. Try out vegetarian recipes for spaghetti, lasagna, chili, or other foods using vegetables instead of meat. Include at least one leafy green or yellow vegetable for vitamin A such as spinach, broccoli, winter squash, greens, or carrots each day. Include at least one vitamin C–rich fruit or vegetable, such as oranges, grapefruit, strawberries, melon, tomato, and broccoli each day. Add a fruit or vegetable as part of every meal or snack. For example, you could put fruit on cereal, add a piece of fruit or small salad to your child’s lunch, use vegetables and dip for an after-school snack, or add a vegetable or two you want to try to the family’s dinner. Be a role model—eat more fruits and vegetables yourself. Be sure your child is getting the recommended amount of fruits and vegetables each day. Visit choosemyplate.gov​ to find out how much of each food group your child should be getting. 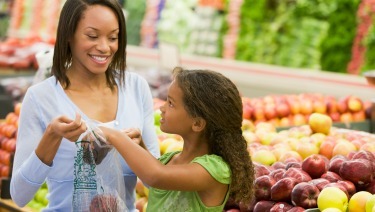 When shopping for food, start in the area of the store where they keep fresh fruits and vegetables. Stock up. That way you know you always have some on hand to serve your child. Avoid buying high-calorie foods such as chips, cookies, and candy bars. Your child may not ask for these treats if they are not in sight. Eat a​s a family whenever possible. Research shows that kids eat more vegetables and fruits and less fried foods and sugary drinks when they eat with the entire family. By choosing health-promoting foods, you can establish good nutritional habits in your child that will last for the rest of his or her life.